Five drivers. One team. The competition of a lifetime. Not a GrabCar driver yet? You’ll want to be one. Grab presents to you Road Stars, a high-stakes competition open to GrabCar drivers only. All you need to do is form a five-player team made up of existing and new drivers, then start scoring points with every ride you complete. Ready? On your mark, gather your team, go! The general rule of thumb is, every ride gives your team points. Of course, to ensure the rides still provide quality service for our passengers, we will take ratings into consideration. Apart from winning prizes as a team, participants who bring in new Drivers will of course benefit from the Driver Referral program. On top of that, we’ll be releasing more prizes as the competition progresses. and many more cash prizes to be won! Q1: How many people do I need to form a team? 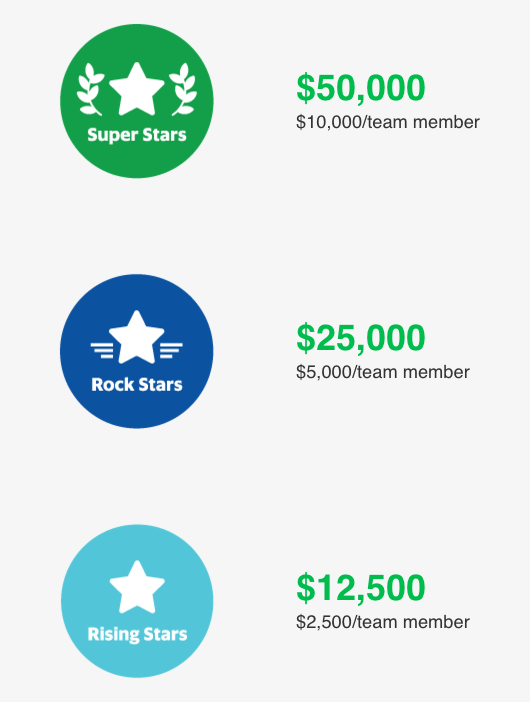 Every team in Road Stars must have 5 participants, and at least 3 of the participants have to be new Grab drivers. In other words, each team can only have a maximum of 2 existing Grab drivers. Q2: What do ‘new’ and ‘existing’ Grab driver mean? New Grab driver: A driver whose GrabCar account is activated after 8 March. Existing Grab driver: A driver whose GrabCar account was activated on before 8 March. Q3: Can my team still participate if we don’t have any new drivers? Sadly, the answer is no. If you know any friends or family who are not driving with Grab, this is the best month to encourage them to join Grab. To help sweeten the deal, we have created attractive referral fees and special first month incentives for all new drivers. Every new friend you refer will earn you up to $500 in referral rewards. Plus, your friend gets to earn up to $1,060 in weekly incentives, and participate in Road Stars too! Q4: If I take part in Road Stars, would I still get my March referral fees for each of my referrals? Yes, you would. The prizes you get from Road Stars are on top of the referral rewards we are paying out for March. This is also on top of all fares and normal incentives. Q5: Will I still get my incentives if I take part in Road Stars? Yes, you will. The prizes from Road Stars are on top of all fares and incentives you earn. Q6: I don’t have a team of 5 yet. Can I register for Road Stars first and then add members to my team when I find them? Unfortunately, you need to have 5 members in your team before you can register for Road Stars. If you submit an application with less than 5 team members, your registration will not be approved and you will have to resubmit again. Q7: Can my team win if we don’t drive full-time? Yes, you may. Both full-time and part-time drivers can take part in Road Stars. If your team has a great strategy, you might still win. Q8: Does this mean that Road Stars is more than just collecting points from the trips we make as a group? Are there bonus stages? That’s right! To keep things interesting, we’ve created Road Stars to include twists and turns. We can’t share much now, but all we can say is that there will be special mini-games where bonuses can be earned. In summary, every team has a winning chance. So, keep your eyes out and strategise well as a team. Q9: My team is approved. What should I do next? Congratulations! We encourage all of you to start communicating within your group. If you are an existing seasoned driver, share your driving knowledge with the newer members of the team. And if you are new to driving with Grab, feel free to reach out and ask questions to your team and start practising. Remember, Road Stars is a team game that emphasises on teamwork. So the better you work as a team, the higher your chances of winning. Q10: Can I change teams or team names? Once approval has been given for your team’s registration, the team name and members are final. Q11: Can I join more than one team? No, your individual points can only count towards one team. Any team registration form with drivers already on other teams will not be approved. Q12: How can we keep track of the points we’ve collected on Road Stars? We’ll update each team regularly on their team scores and will be creating a leaderboard on our campaign page. More details to come. “ROAD STARS” (“the Campaign”) is organised by Grab Pte Ltd. (“the Organiser”) and is open to all Grab drivers. The campaign will run from 8 March – 7 May 2017, Grab Pte Ltd reserves the sole and absolute right to alter or end the contest at any time, without giving prior notice or compensate in cash or in kind.